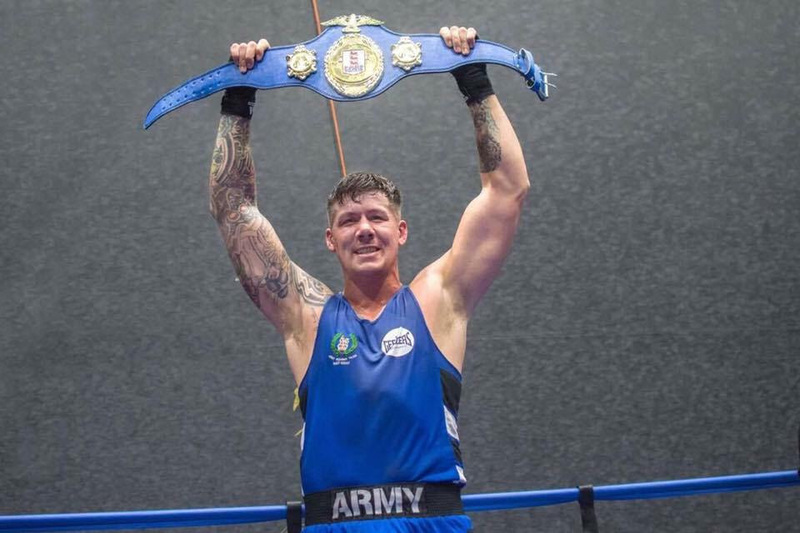 Army officer and ABA champ Chez Nihell turns pro on DeGale v Eubank Jr.
LCpl Chez Nihell, 6-time UK Combined Services Champion and England’s reigning ABA Elite Super Heavyweight Champion, will make his pro debut on a massive stage at The O2 on Saturday 23rd February. The event is promoted by Poxon Sports for Premier Boxing Champion (PBC). Chez, a member of The 27 Regiment Royal Logistics Corps, will step between the ropes on an electrifying night. February 23 is headlined by the long-awaited clash between bitter rivals James DeGale and Chris Eubank Jr.
A fiery head-to-head between Commonwealth Heavyweight Champion Joe Joyce and Former World Champion Bermane Stiverne. Chez served in Afghanistan with The 1st Battalion Princess of Wales Royal Regiment. He’s been part of the Army Elite Boxing set-up since 2013. The powerful switch hitting counter-puncher won the England Super Heavyweight Title Series belt in 2016. He defended it three times before being crowned ABA Elite Super Heavyweight Champion in 2018. Nihell joined an exclusive class of boxers including Anthony Joshua, Tyson Fury, Dereck Chisora and Joe Joyce. Having capped off his amateur career in style, Chez made the decision to turn pro after being named British Army Sportsman of the year in November 2018. With the backing of the British Army he has received special permission to combine his status as a serving soldier with launching his professional career. To add an intriguing subplot to the story, Chez will have his wife LCpl Alanna Nihell in his corner. Alanna is a serving soldier herself and was the first female to Captain the Army Elite Boxing Team for two successive years. She is an official Second and decorated champion having secured three ABA Lightweight titles. Added to that a Commonwealth Games Bronze Medal in 2014. There’ll be booming support from The Army in The O2 stands on February 23rd. DeGale v Eubank Jr. promises to be an explosive night of raw action. Looking ahead to fighting in front of a huge army crowd, Chez said, “This is what dreams are made of. You only make one pro debut and to make my debut on a stacked card at London’s 02 live on ITV. “Also doing it with the British Army and my wife Alanna. She has been a major part of my army and boxing life (that’s how we got together).